Further, while it’s true that the creators of iPhone and TiVo maintain a high degree of control over the guts of the devices or their operating systems, the technologies themselves are hardly sterile or non-generative. In fact, these devices have amazing uses, and they have both recently become more open to third-party add-ons and applications. Geeks who demand still more are also hacking away at these and other digital devices to get them to do everything but wash their dishes.Most of us want networks and digital devices that work. Zittrain, by contrast, seems to long for the era when we all had to load floppy disks into our PCs each morning to get our operating systems running. But those were hardly the good old days. Device makers realized that only techno-geeks would tolerate such hassles, and so our PCs and phones now come with more software and services built in to make our lives easier. Nothing stands in the way of those who still prefer the rugged individualist approach to conquering cyber-frontiers and digital devices. But what Zittrain does in The Future of the Internet is generalize his personal preferences to the whole of cyber-society. What’s good for the ivory-tower digerati may not be what the rest of us want or need. If you are interested you can read the entire review here. 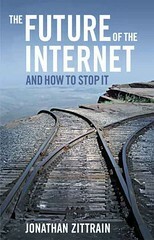 Again, I encourage you to read Zittrain’s entire book and decide for yourself if my critique is unfair. Despite my criticisms, it’s a very well-written and interesting book. As with everything Jonathan does, he has a special gift for making nerdy tech policy issues both interesting and entertaining. Previous post: The ‘D’ Word?